November 5: The Citizens Group on Electoral Reforms (CGEP) convened by PILDAT has stressed that comprehensive preparations are a vital pre-requisite to ensure that the forthcoming Local Government elections are authentically free, fair and transparent and that the arrangements for them reflect some of the important lessons learnt from the General Elections of May 2013. The Group noted with regret that there is a serious absence of commonality and consistency on the fundamental issue of whether these Local Government polls in all 4 Provinces should be held on a party basis or a non-party basis. At this time, Sindh and Balochistan will hold polls on a party basis. Khyber Pakhtunkhwa will hold polls on a mixed basis (i.e. non- party basis for village level, Party basis for Tehsil and District Level) but the Province with the largest population i.e. Punjab is set to hold the polls on a non-party basis. Whereas the Lahore High court has not yet delivered its final judgment on the petition challenging the non-party basis. Thus, despite the declared agreement between major political parties to create a prior consensus for a common basis to hold the Local Government polls, the imminent elections are to be held without such a common and shared basis. We urge that on a fundamental principle such as the party/no-party dimension, all 4 Provinces should ensure a common, shared basis. The Group also said; “We would urge the Prime Minister and the Leader of Opposition to take immediate consultation steps for the appointment of a permanent Chief Election Commissioner. It is not appropriate that at a time when the Honourable Supreme Court has directed that all Local Government elections be held within the time-limits set by it, the Election Commission should be headed by the senior Judge of the Supreme Court who is to become its Chief Justice in the second week of December 2013”. With Justice (Rtd.) Saiduzzaman Siddiqui, former Chief Justice of Pakistan, in the chair, the CGEP members who joined the meeting included Mr. Ghazi Salahuddin, Renowned Jounrnalist; Lt. Gen. (Rtd.) Moinuddin Haider, Fomer Governor Sindh and Interior Minister; Mr. Mujib-ur-Rehman Shami, Renowned Journalist; Justice (Rtd.) 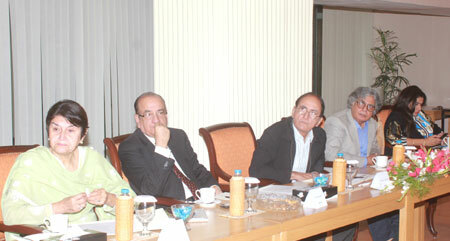 Nasira Iqbal, Former Judge Lahore High Court; Mr. Shahid Hamid, Former Governor Punjab; Dr. Hassan Askari Rizvi, Political & Defence Analyst; Mr. Arif Nizami, Editor, Pakistan Today; Mr. Fahd Hussain, Anchor, Capital TV; Dr. Ijaz Shafi Gilani, Chairman, Gallup Pakistan; Mr. Javed Jabbar, Former Senator & Federal Minister for Information; Mr. Ahmed Bilal Mehboob, President PILDAT and Ms. Aasiya Riaz, Joint Director PILDAT.